So, what changed since the release of the original paper in 2016? Quite a lot! We discovered that we could make the framework much more powerful by adding some new concepts to the code which I want to show you now. As you can see, the <messageIssuer> tags are gone. Instead, you now indicate with the type of action how you want to deal with the message. Another important thing: TLS-Attacker uses WorkflowTraces as an input as well as an output format. In the old version, once a WorkflowTrace was executed it was hard to see what actually happened. Especially, if you specify what messages you expect to receive. In the old version, your WorkflowTrace could change during execution. This was very confusing and we, therefore, changed the way the receiving of messages works. The ReceiveAction has a list of <expectedMessages>. You can specify what you expect the other party to do. This is mostly interesting for performance tricks (more on that in another post), but can also be used to validate that your workflow executedAsPlanned. Once you execute your ReceiveAction an additional <messages> tag will pop up in the ReceiveAction to show you what has actually been observed. Your original WorkflowTrace stays intact. During the execution, TLS-Attacker will execute the actions one after the other. There are specific configuration options with which you can control what TLS-Attacker should do in the case of an error. By default, TLS-Attacker will never stop, and just execute whatever is next. Usually, the RSAClientKeyExchange message is constructed with the public key from the received certificate message. But in this WorkflowTrace, we did not receive a certificate message yet. So what public key are we supposed to use? The previous version had "some" key hardcoded. The new version does not have these default values hardcoded but allows you as the user to define the default values for missing values, or how our own messages should be created. For this purpose, we introduced the new concept of Configs. A Config is a file/class which you can provide to TLS-Attacker in addition to a WorkflowTrace, to define how TLS-Attacker should behave, and how TLS-Attacker should create its messages (even in the absence of needed parameters). For this purpose, TLS-Attacker has a default Config, with all the known hardcoded values. It is basically a long list of possible parameters and configuration options. We chose sane values for most things, but you might have other ideas on how to do things. You can execute a WorkflowTrace with a specific config. The provided Config will then overwrite all existing default values with your specified values. If you do not specify a certain value, the default value will be used. I will get back to how Configs work, once we played a little bit with TLS-Attacker. The TLS-Client is a simple TLS-Client. Per default, it executes a handshake for the default selected cipher suite (RSA). The only mandatory parameter is the server you want to connect to (-connect). So what is going on here? Let's start with the first execution. As I already mentioned. TLS-Attacker constructs the default WorkflowTrace based on the default selected cipher suite. When you run the client, the WorkflowExecutor (part of TLS-Attacker which is responsible for the execution of a WorkflowTrace) will try to execute the handshake. For this purpose, it will first start the TCP connection. This is basically what you see in the console output. The first action which gets executed is the SendAction with the ClientHello. Then, we expect to receive messages. Since we want to be an RSA handshake, we do not expect a ServerKeyExchange message, but only want a ServerHello, Certificate and a ServerHelloDone message. As you can see, we now executed a complete ephemeral elliptic curve handshake. This is, because the -cipher flag changed the <defaultSelectedCiphersuite> parameter (among others) in the Config. Based on this parameter the default WorkflowTrace is constructed. If you want, you can specify multiple cipher suites at once, by seperating them with a comma. For a complete reference of the supported Config options, you can check out the default_config.xml. Most Config options should be self-explanatory, for others, you might want to check where and how they are used in the code (sorry). As you can see I just send a ServerHello message instead of a ClientHello message at the beginning of the handshake. This should obviously never happen but let's see how the tested server reacts to this. The server (correctly) responded with an UNEXPECTED_MESSAGE alert. Great! 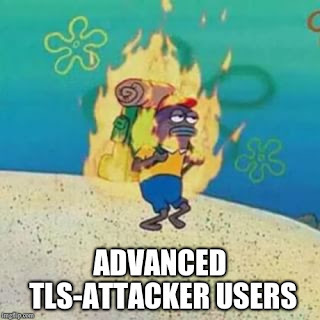 You are now familiar with the most basic concepts of TLS-Attacker, so let's dive into other things TLS-Attacker can do for you. As a TLS-Attacker user, you are sometimes interested in the actual values which are used during a WorkflowTrace execution. For this purpose, we introduced the -workflow_output flag. With this parameter, you can ask TLS-Attacker to store the executed WorkflowTrace with all its values in a file. As you can see, although the input WorkflowTrace was very short, the output trace is quite noisy. TLS-Attacker will display all its intermediate values and modification points (this is where the modifiable variable concept becomes interesting). You can also execute the output workflow again. Note that at this point there is a common misunderstanding: TLS-Attacker will reset the WorkflowTrace before it executes it again. This means, it will delete all intermediate values you see in the WorkflowTrace and recompute them dynamically. This means that if you change a value within <originalValue> tags, your changes will just be ignored. If you want to influence the values TLS-Attacker uses, you either have to manipulate the Config (as already shown) or apply modifications to TLS-Attackers ModifiableVariables. The concept of ModifiableVariables is mostly unchanged to the previous version, but we will show you how to do this real quick anyway. For historical reasons, 0x0303 means TLS 1.2. 0x0300 was SSL 3. 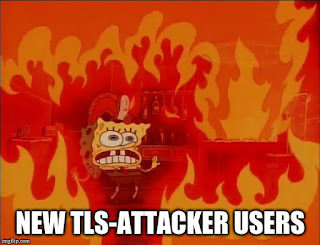 When they introduced TLS 1.0 they chose 0x0301 and since then they just upgraded the minor version. As a rule of thumb: If the value is only up to 1 byte of length we use a ModifiableByte. If the value is up to 4 bytes of length, but the values are used as a normal number (for example in length fields) it is a ModifiableInteger. Fields which are used as a number which are bigger than 4 bytes (for example a modulus) is usually a ModifiableBigInteger. Most other types are encoded as ModifiableByteArrays. The other types are very rare (we are currently working on making this whole process more transparent). Once you have found your type you have to select a modification to apply to it. For manual analysis, the most common modifications are the XOR modification and the explicit value modification. However, during fuzzing other modifications might be useful as well. Often times you just want to flip a bit and see how the server responds, or you want to directly overwrite a value. In this example, we want to overwrite a value. Let us force TLS-Attacker to send the version 0x3A3A. To do this I consult the ModifiableVariable README.md for the exact syntax. Since <protocolVersion> is a ModifiableByteArray I search in the ByteArray section. With Wireshark you can now observe that the protocol version got actually changed. You would also see the change if you would specify a -workflow_output or if you start the TLS-Client with the -debug flag. This action does basically what the CCS message does. It activates the currently "negotiated" parameters. If necessary values are missing in the context of the connection, they are drawn from the Config. This action does the opposite. If the encryption was active, we now send unencrypted again. Prints the last application data message either sent or received. Prints the secrets (RSA) from the current connection. This includes the nonces, cipher suite, public key, modulus, premaster secret, master secret and verify data. Resets the message digest. This is usually done if you want to perform a renegotiation. Closes and reopens the connection. This can be useful if you want to analyze session resumption or similar things which involve more than one handshake. Send a ClientKeyExchange message, and always chooses the correct one (depending on the current connection state). This is useful if you just don't care about the actual cipher suite and just want the handshake done. (Maybe) sends a ServerKeyExchange message. This depends on the currently selected cipher suite. If the cipher suite requires the transmission of a ServerKeyExchange message, then a ServerKeyExchange message will be sent, otherwise, nothing is done. This is useful if you just don't care about the actual cipher suite and just want the handshake done. This lets TLS-Attacker sleep for a specified amount of time (in ms). 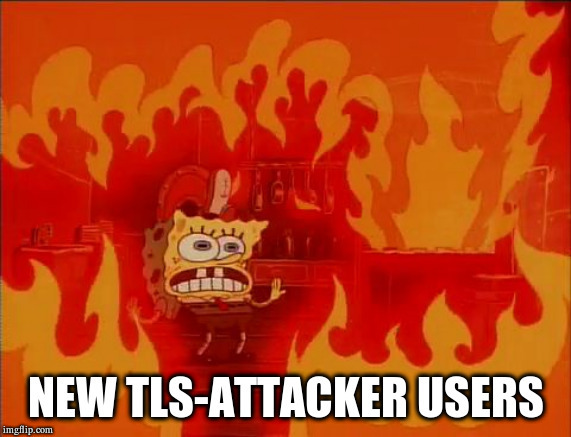 As you might have already seen there is so much more to talk about in TLS-Attacker. But this should give you a rough idea of what is going on. If you have any research ideas or need support feel free to contact us on Twitter (@ic0nz1, @jurajsomorovsky ) or at https://www.hackmanit.de/. If TLS-Attacker helps you to find a bug in a TLS implementation, please acknowledge our tool(s). If you want to learn more about TLS, Juraj and I are also giving a Training about TLS at Ruhrsec (27.05.2019).